1. The Governing Body Commission (GBC) will be the ultimate managing authority of the entire International Society for Krishna Consciousness. 2. Each temple will be an ISKCON property and will be managed by three executive directors. The system of management will continue as it is now and there is no need of any change. a) Properties at Sri Mayapur Dhama, Panihati, Haridaspur and Calcutta: Gurukrpa Swami, Jayapataka Swami, Bhavananda Gosvami and Gopal Krsna das Adhikari. b) Properties at Vrndavana: Gurukrpa Swami, Akshoyananda Swami, and Gopal Krsna das Adhikari. c) Properties at Bombay: Tamala Krsna Gosvami, Giriraj das Brahmachary, and Gopal Krsna das Adhikari. d) Properties at Bhubaneswar: Gour Govinda Swami, Jayapataka Swami, and Bhagawat das Brahmachary . e) Properties at Hyderbad: Mahamsa Swami, Sridhar Swami, Gopal Krsna das Adhikari and Bali Mardan das Adhikari. The executive directors who have herein been designated are appointed for life. In the event of death or failure to act for any reason of any o( the said directors, a successor director or directors may be appointed by the remaining directors, provided the new director is my initiated disciple following strictly all the rules and regulations of the International Society for Krishna Consciousness as detailed in my books, and provided that there are never less than three (3) or more than five (5) executive directors acting at one time. 4. 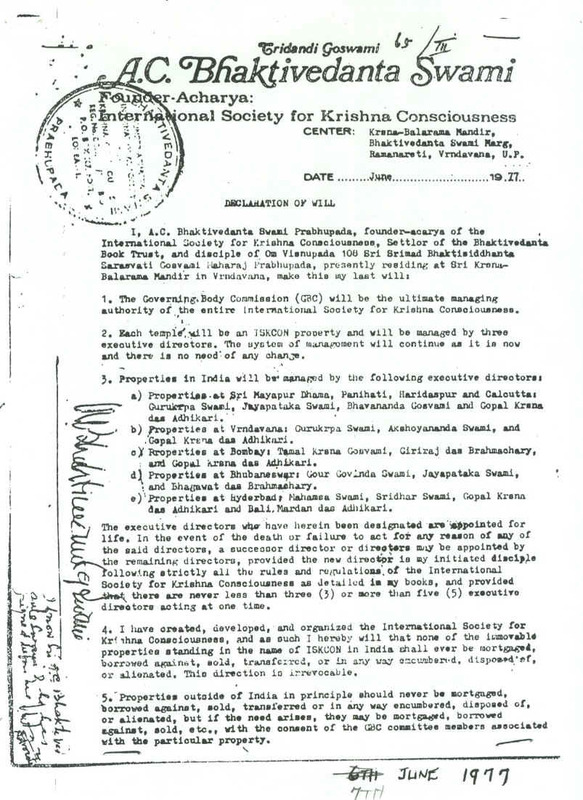 I have created, developed and organized the International Society for Krishna Consiousness, and as such I hereby will that none of the immovable properties standing in the name of ISKCON in India shall ever be mortgaged, borrowed against, sold, transferred, or in any way encumbered, disposed of, or alienated. This direction is irrevocable. 5. 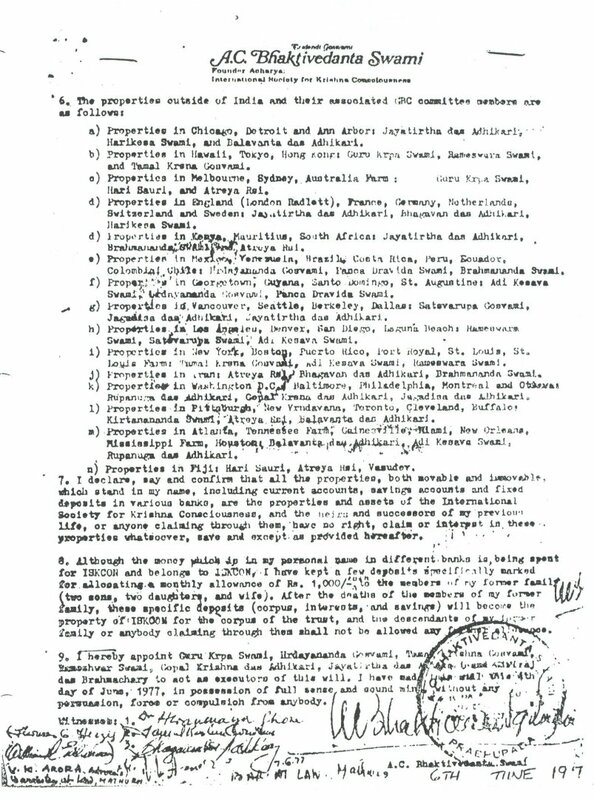 Properties outside of India in principle should never be mortgaged, borrowed against, sold, transferred or in any way encumbered, disposed of, or alienated, but if the need arises, they may be mortgaged, borrowed against, sold, etc., “with the consent of the GBC committee members associated with the particular property. b) Properties in Hawaii, Tokyo, Hong Kong: Guru Krpa Swami, Ramesvara Swami and Tamal Krishna Gosvami. c) Properties in Melbourne, Sydney, Australia Farm,: Guru Krpa Swami, Hari Sauri, and Atreya Rsi. d) Properties in England (London Radlett), France, Germany, Netherlands, Switzerland and Sweden: Jayatirtha das Adhikari, Bhagavan das Adhikari, Harikesa Swami. 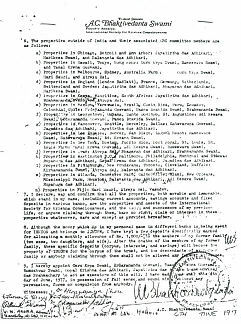 e) Properties in Mexico, Venezuala, Brazil, Costa Rica, Peru, Ecquador, Colombia, Chile: Hrdayananda Gosvami, Panca Dravida Swami, Brahmanananda Swami. t) Properties in Georgetown, Guyana, Santo Domingo, St. Augustine: Adi Kesava Swami, Hrdayananda Gosvami, Panca Dravida Swami. g) Properties in Vanouver, Seattle, Berkeley, Dallas: Satsvarupa Gosvami, Jagadisa das Adhikari, Jayatirtha das Adhikari. h) Properties in Los Angeles, Denver, San Diego, Laguna Beach: Rameswara Swami, Satsvarupa Swami, Adi Kesava Swami. i) Properties in New York, Boston, Puerto Rio, Port Royal, St. Louis, St Louis Farm: Tarnal Krishna Gosvami, Adi Kesava Swami, Rameswara Swami. j) Properties in Iran: Atreya Rsi, Bhagavan das Adhikari, Brahmanananda Swami. k) Properties in Washington D.C., Baltimore, Philadelphia, Montreal and Ottawa : Rupanuga das Adhikari, Gopal Krishna das Adhikari, Jagadisa das Adhikari. I) Properties in Pittsburg, New Vrndavana, Toronto, Cleveland, Buffalo: Kirtanananda Swami, Atreya Rsi, Balavanta das Adhikari. m) Properties in Atlanta, Tennessee Farm, Gainsville, Miami, New Orleans, Mississippi Farm, Houston: Balavanta das Adhikari, Adi Kesava Swami, (Rupanuga das Adhikari. n) Properties in Fiji: Hari Sauri, Atreya Rsi, Vasudev. 7. 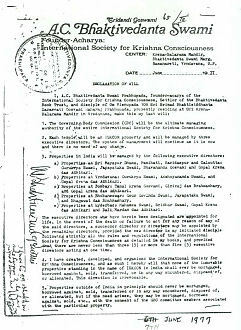 I declare, say and confirm that all the properties, both moveable and immovable, which stand in my name, including current accounts, savings accounts and fixed deposits in various banks, are the properties and assets of the International Society for Krishna Consciousness, and the heirs and successors of my previous life, or anyone claiming through them, have no right, claim or interest in these properties whatsoever, save and except as provided hereafter . 8. Although the money which is in my personal name in different banks is being spent for ISKCON and belongs to ISKCON, I have kept a few deposits specifically marked for allocating a monthly allowance of Rs. 1,000/- each to the members of my former family, (two sons, two daughters, and a wife). After the death of the members of my former family, these specific deposits (corpus, interest, and savings) will become the property of ISKCON for the corpus of the trust, and the descendants of my former family or anybody claiming through them shall not be allowed any further allowance. 9. I hereby appoint Guru Krpa Swami, Hrdayananda Gosvami, Tarnal Krishna Gosvami, Rameswara Swami, Gopal Krsna das Adhikari, Jayatirtha das Adhikari and Giriraj das Brahmachary to act as executors of this will. I have made this will this 4th day of June, 1977, in possession of full senses and sound mind, without any persuasion, force or compulsion from anybody.